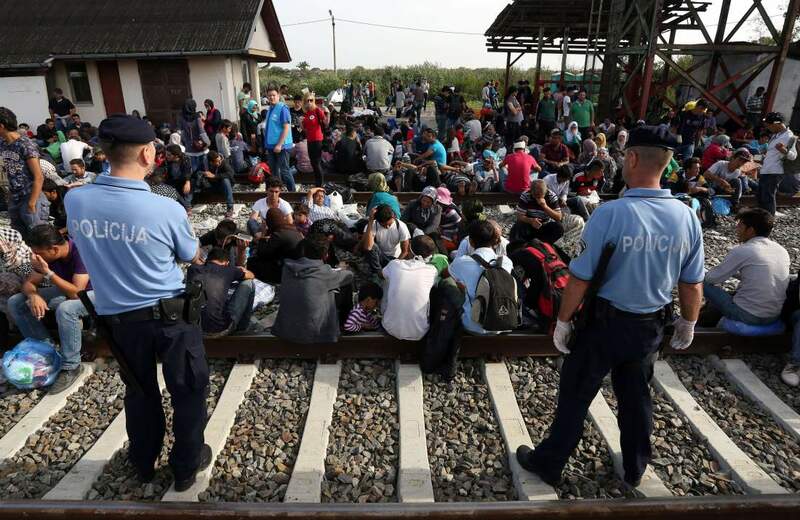 Croatia has decided to close seven of its eight road border crossings with Serbia following a huge influx of refugees. Croatian officials said they had no choice after more than 13,000 people entered the country since Hungary fenced off its border with Serbia earlier this week. Many refugees have been taken by bus to reception centers but some say they plan to walk to neighboring Slovenia. Huge numbers of people heading north from the Mediterranean have created a political crisis in the EU. The crossing on the main road linking Belgrade and Zagreb – at Bajakovo – appeared to be the only one left open. On September 17, Croatian Interior Minister Ranko Ostojic said his country was “absolutely full”. However, a Reuters journalist at the scene reported that refugees were walking through fields to bypass one of the border crossings. Scuffles broke out in two locations on the border with Serbia on September 17 after people were left waiting for hours for transport further north. Crowds briefly broke through police lines at Tovarnik and Batina – two of the crossings now closed. Buses arrived just before midnight but not enough to transport everyone. Drivers said people were being taken to a reception centre. Many refugees appear to have slipped away to continue their journey north on foot.